Why did you decide to pursue a nursing degree? As a former United States Marine and Police Officer, I have always had a passion to serve and help others. I was discouraged with police work because I felt it was a very reactive approach to helping the community. For me, nursing is an opportunity to make a difference in the lives of patients through education and actively involving them in the plan of care. This career not only allows me to help others in a tertiary care setting, but I can be involved in implementing primary prevention strategies through health promotion. Nursing is a profession that deals with people and requires true compassion. I am passionate about working with patients and helping them navigate through their complex healthcare needs. 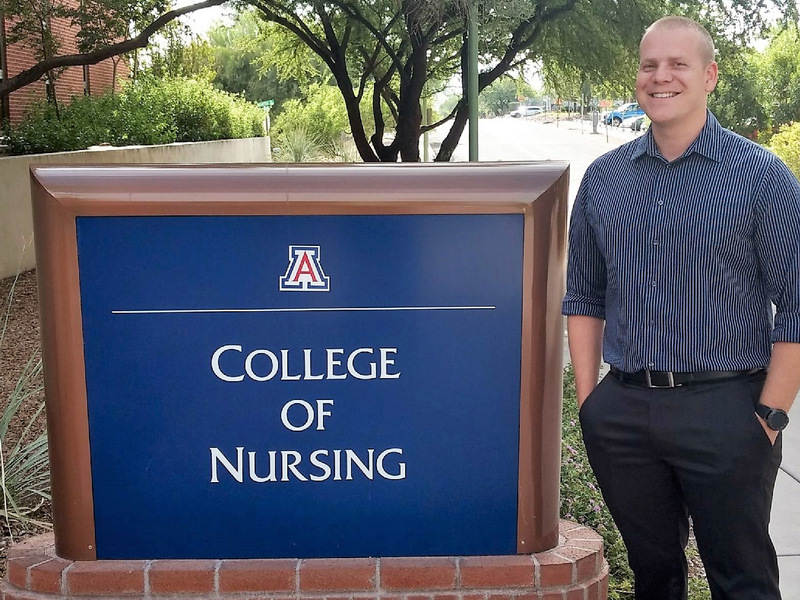 What drew you to the UA College of Nursing? As a former graduate from the University of Arizona, Eller Business College with a bachelor’s degree in Public Administration, I have always been a Wildcat at heart. I love the UA because of its dynamic and innovative teaching strategies with a research focus. Specifically, when I researched the UA College of Nursing I knew it was where I wanted to be. The Master of Entry to the Profession of Nursing was a great fit for me as a husband, father and prior graduate. I felt the school was innovative, challenging and invested in the students. I immediately could tell upon observation that the instructors were passionate about student success. I really liked the physical environment of this school and was excited about the emphasis placed on critical thinking within the program. What features of your program are you especially passionate about? I am extremely passionate about the focus placed on independent and critical thinking within a fast-paced and challenging environment. I feel like I have learned so much and gained the most out of a nursing program because of the high expectations placed upon students. Within a clinical setting, we are not just observers of care, but are expected to manage care beside the primary nurse. This program has challenged and prepared me for this amazing career. Please share your favorite memory from your time at the CON. One of my favorite memories was conducting a role-playing scenario on Therapeutic Communication within one of our early nursing courses. It was a great moment with close friends to share a hard laugh and learn in a non-stressful environment. I also have a lot of great memories within the clinical setting. I enjoyed working with patients, great instructors, and nurse mentors. How do you intend to Build Better Futures? I intend to build better futures by not only helping one critical care patient at a time, but making a difference at a hospital and community level. I plan to be involved in developing hospital and local healthcare policy. I hope to use my foundational education in research and evidence-based practice to make quality improvement initiatives within nursing. I believe there is a need for more advanced nurses within the hospital setting to make effective changes. I would like to be a role-model and mentor for other nurses and students to encourage evidence-based nursing and patient advocacy. Outside of the profession, I hope to be a role-model for my three children. I want them to learn that it is important to care for others and utilize their education to help change the world. I am appreciative of those who have helped me achieve an education in nursing, so I can support my family and provide a better future.